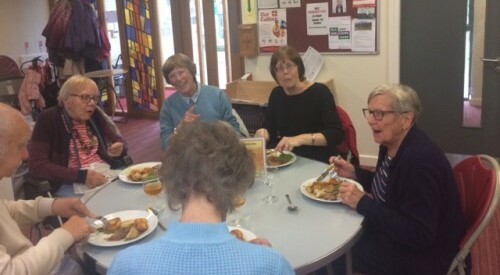 As part of Catholic Care’s Embrace project the newly formed Lunch at The Lion Club was on Safari again last week when one of it’s members invited everyone to a Silsden Methodist Church lunch – this meal is open to anyone from the locality but people come from as far away as Oakworth it’s so good! 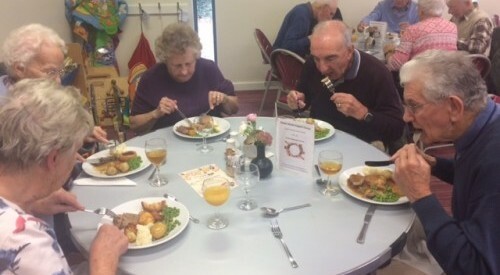 We enjoyed a very fine two course meal with coffee to follow and we all had a great time chatting to new people, hopefully some of whom will join us at The Red Lion on future Wednesdays, which is where we really belong. Lunch at the Lion takes place every Wednesday at 12.30 pm at The Red Lion pub,Silsden. Sandwiches, crisps/biscuits plus a hot drink all for £3 and of course great conversation. Look forward to seeing you there.